The program of extermination Nazis called the Final Solution took the lives of approximately six million Jews, amounting to roughly 60 percent of European Jewry and a third of the world's Jewish population. Studying the Holocaust from a sociological perspective, Ronald J. Berger explains why the Final Solution happened to a particular people for particular reasons; why the Jews were, for the Nazis, the central enemy. Taking a unique approach in its examination of the devastating event, The Holocaust, Religion, and the Politics of Collective Memory fuses history and sociology in its study of the Holocaust.Berger's book illuminates the Holocaust as a social construction. As historical scholarship on the Holocaust has proliferated, perhaps no other tragedy or event has been as thoroughly documented. Yet sociologists have paid less attention to the Holocaust than historians and have been slower to fully integrate the genocide into their corpus of disciplinary knowledge and realize that this monumental tragedy affords opportunities to examine issues that are central to main themes of sociological inquiry.Berger's aim is to counter sociologists who argue that the genocide should be maintained as an area of study unto itself, as a topic that should be segregated from conventional sociology courses and general concerns of sociological inquiry. 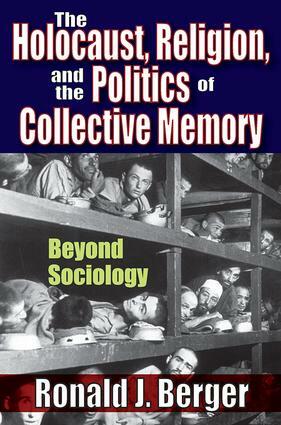 The author argues that the issues raised by the Holocaust are central to social science as well as historical studies.